The first time Abdulmalek JanMohammed ever robbed Imperial Bank, he had a gun to his head. Three short years later, he became the robber, carrying out a heist so elaborate its web is still being untangled, five months after his death. If you do a Google image search of Abdulmalek Janmohammed you will only find five images of him. Three of them center on events of a partnership between Imperial Bank and the English football club, Arsenal FC. The fourth appears to be from a press briefing, with the Imperial Bank logo appearing prominently behind him. In the last one, he’s seated on the edge of a beige leather couch, posing awkwardly. In the images, Abdulmalek appears pensive and uncomfortable. In one where he’s holding the right sleeve of an Arsenal jersey, he looks mad while everyone else is smiling. The other images suggest why. A round man with a protruding, pesky potbelly and a double chin, his hands are always clasped on his stomach as if hiding it. Its a clue of vanity and self-pacification, and perhaps a hint of the man and his fears. It, however, suggests little of the man who Central Bank says, carried out a bigger scandal than Goldenberg. Almost half a year after his death, Abdulmalek remains a mystery, and the bank is still closed. On the last day of April 1998, three amateur kidnappers bundled an elderly Ismaili man and his driver into the back of a stolen BMW 320 and drove them to a house they had rented in Karen. They then drove to the home of a third man and kidnapped him too. It was the perfect plan. 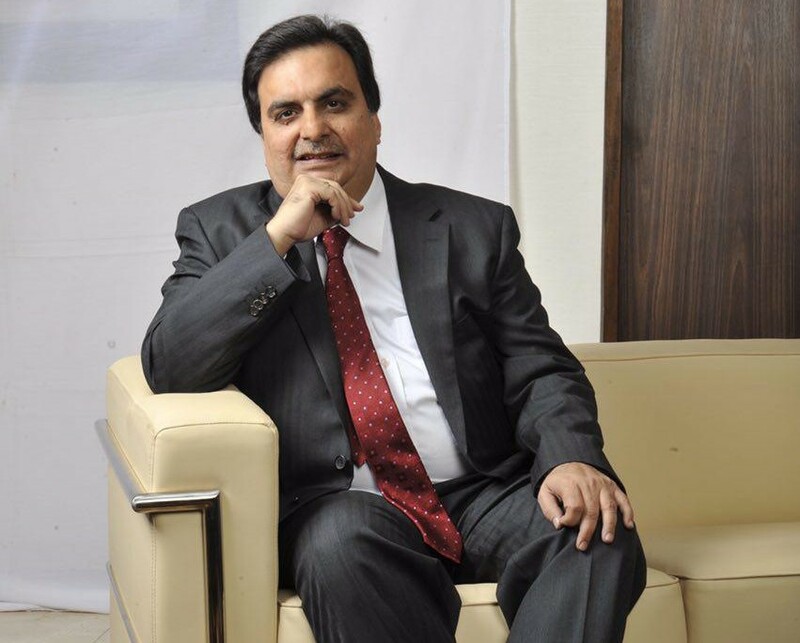 In two uneventful swoops, the kidnappers had nabbed two important men, Abdul Karim Popat, the Chairman of Imperial Bank and Abdulmalek JanMohammed, the Managing Director of the six-year-old bank. 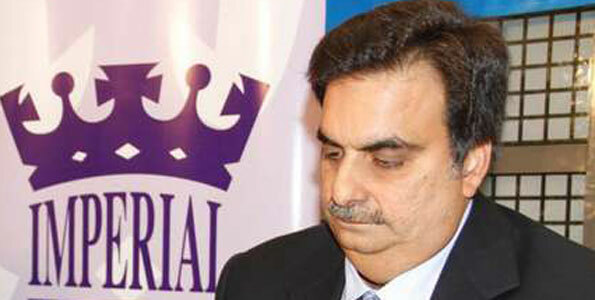 The third victim was Popat’s driver, Stephen Kamau. To be released, Abdulmalek JanMohammed was forced to rob his own bank. With the cold muzzle of a gun pressing against the back of his head, he unlocked his bank in the middle of the night. He led the robbers to the Chairman’s office, to the safe, which had KES 500, 000. Abdulmalek was then released mostly unhurt but visibly shaken. Stupidly, the kidnappers retained his cell phone, setting themselves up for one of the first criminal investigations to feature mobile phone signal tracking in Kenya. Four years after this harrowing ordeal, Abdulmalek JanMohammed began a bank robbery of his own. Court documents filed by the Central Bank of Kenya on October 28th, 2015, revealed that he had stolen KShs. 38.5 billion from his own bank, mainly through a shady company called W.E. Tilley. For a man who orchestrated one of the biggest and most elaborate bank heists in Kenyan history, little is known about Abdulmalek Janmohammed. It is hard, even now, to find any single person who can draw a complete image of the man. Instead, everyone who knew or worked for him knew only a part of the man, the part he permitted them to see. He was obsessively private and kept a small circle of friends, most of whom would become cogs in his secret plans for the bank he headed. Abdul or AJ, as his friends called him, was born in 1959 to Gulshan and her husband, Abdulsultan Janmohammed in Karachi, right before they moved to Mombasa. He was the stocky, introverted second born, following his elder brother Mehdi’s birth in January 1951. Their last born, Salim, was born in July 1962. Abdulsultan, a wily man, died in the 1980s after a series of heart attacks as his second son would three decades later. Of the three brothers, only Abdulmalek went into banking. Mehdi and Salim became accountants and went into hospitality. Mehdi now works for Sopa Lodges, while Salim worked for TPS Serena until August 2015, the month before their brother died. He, Salim, was fired over alleged fraud and has since sued the hotel chain. Both Mehdi and Salim lived and worked in Arusha, Tanzania while Abdulmalek lived in Riverside with their mom. It was a small, close-knit Ismaili family, with Mehdi and Salim driving down from Arusha fortnightly for dinner and social events. All of Gulshan’s children were thriving by the mid-1990s, but it was Abdulmalek who struck gold. After completing a bachelors degree in finance and management of data systems from Syracuse University in New York, he entered the banking world as a management trainee at Diamond Trust Bank. He moved banks and in just a few years was the 4th most senior executive at CFC Bank. Always clad in a blue or black suit, a crisp white shirt, and a blue or red tie, the young man was growing into a rounded, stocky man with chubby cheeks and a peeking double chin. Whenever he spoke, his deep voice barely audible, he forced his audience to listen. He was brief and brilliant, with a weird smile and searching eyes. Mostly, he was quiet, always choosing to let others speak before him and only getting animated when he was truly passionate. From the very start, Abdulmalek was a brilliant and ambitious banker, showing impeccable judgment and focus. His meteoric rise was earned through sheer hard work, with him sacrificing nearly the entirety of a social life to work. But even that fast rise was not enough. He was still someone else’s employee, bound by workplace rules and his job description. He wanted more. That chance brought itself sooner than he expected. In 1991, Abdulmalek was invited to a meeting by Simba Colt founder, Abdul Karim Popat. Founded in 1948, Simba Colt had grown from a small used car dealership on Koinange Street into a Mitsubishi franchise. It had merged with CMC, the oldest and biggest car dealership in the region, in 1977. The partnership lasted four short years and by the late 1980s, Abdul Popat was looking for ways to grow his empire. One of the biggest ideas on his in-tray was to found a hire purchase arm. Hire purchase had been, since the 1970s, on a rapid rise in Kenya. To test this new entry, Popat poached one of CFC’s youngest and most suave executives, a 32-year-old man called Abdulmalek JanMohammed. Abdulmalek was everything a self-made man like Abdul Popat was looking for in the next generation of Ismaili entrepreneurs. With no pedigree, the young banker had climbed up the ranks fast and with surety. He was educated, confident and hungry. Not only was he not flashy but he was respectful and courteous to a fault. Within just a few months into his new job, Abdulmalek already saw it as something bigger than a department. He had already discussed the possibility with his new boss but once the hire purchase arm was stable, he took his own proposal seriously. He would build a bank. For Abdulmalek, the hire purchase department was too small an idea for 1992. The Berlin Wall had fallen and global finance was bound to change drastically. Just five years before, a banking crisis had rocked the market, breaking apart the weaker players and reducing Kenya’s banking sector from 29 commercial banks to less than half that number. It had been one of his first experiences as a young banker, the collapse of an entire sector and the cannibalization of smaller ones. This time, he was not going to be a spectator. So a group of wealthy, aging, self-made men sat at Abdul Popat’s invitation and agreed to give the small hire purchase department the financial muscle it needed to become a bank. This trust and foresight would give him immense power and control over the company and its future, something that would, within the decade, turn on its head. First, the hire purchase arm became a Finance and Securities Company and then it was licensed as a fully-fledged bank in 1996. At the helm of one of the fastest-growing banks was a man who wanted to rule the world, his own world. 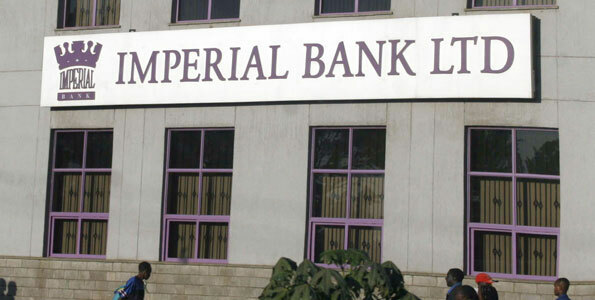 When Imperial Bank opened its doors in 1993, its logo, a prominent purple crown sitting on the bank’s name like a crown on a monarch told the story of this young bank and its ambitious plan. The market Imperial Bank was walking into, with an aggressively ambitious man at the top, was just about to grow exponentially. There were only 15 banks, but there would be 48 in less than a decade. Even the choice of name made it clear Abdulmalek was not building a small bank. He had lofty, imperial dreams, for himself and his new baby. But he would turn its tagline “Looking after your interest!” into something else. To the men who had given Abdulmalek a bank to run, the man proved to have been the right choice. He kept a tight hold of the ship for them to feel comfortable. But what they missed was that he was not as easy to read as he had them think. Even as they relinquished their positions in boards to their sons and successors, Abdulmalek maintained his close contact with them. He lavished them with attention and treated them like kings, using every opportunity to downplay his own success and show them he was still their son. It was a power play and in retrospect, classic Abdulmalek. Abdulmalek was always a rule-breaker, eager to quietly test the limits and see how much he could get away with. Since he was unassuming and exceedingly introverted, most of his experiments were with unsuspecting people. A friend recently recounted a weird exchange that happened at an airport years ago. As the plane taxied, Abdulmalek beckoned one of the stewardesses and told her that his eyesight was so bad he couldn’t fill out his own landing card. Would she care to help him with it? She did, and he had a weird, satisfied smile when he left. When his friend asked about it, knowing the man had rather a sharp eyesight, he shrugged it off. That encounter links with many others of small, unnecessarily manipulative interactions he had with people. In his mind, the world was his playground and everyone was fair game. He wouldn’t pack or unpack his own bags, calling room service every time to do it. It wasn’t laziness but an almost psychopathic urge to seek power through manipulation, even in small doses. In retrospect, most of his employees and friends marvel at his ability to compartmentalize human relationships to obsessive detail, and his uncanny ability to deceive. He quietly but firmly pushed any rules he hadn’t made, and increasingly grew a fatal sense of invincibility. Emails presented to CBK by FTI, an auditing firm, as part of the evidence in the fraud include one on a trove of his conversations, pointing towards a quiet, manipulative leader. He hardly says anything in most of the emails but he is always copied, in every conversation. Even in personal discussions, or one long fight with a partner about a real estate project in Loresho built with some of the stolen money, he lets everyone else fight it out. But all the people on the email thread knew he was the puppeteer behind the strings, with the aggrieved partner complaining about his making it a criminal matter. The deal, to give the partner a commission for selling the apartment units, had failed after no one bought in. So they all agreed to rent them out. The problem was that there was no commission deal for rent, something the real estate agent partner asked, rightly. In response, it emerges from the emails, Abdulmalek had called in the police and Criminal Investigation Department detectives. It was classic Abdulmalek, power over people wasnt meant to be given. It was taken, by all means. For Abdulmalek Janmohammed, people could be controlled in one of three ways. The first one was the easiest, money. Everyone who worked for him directly earned a healthy salary and, if he liked them, random cash gifts. His gifts, even at the mosque and within his community, were always in cash. The in-house joke at the bank was that it was probably the only place in Kenya where the secretary, Anne Mboya, drove a better car than her boss. He owned a Mitsubishi Lancer and a Mitsubishi Gallant, modest cars for a man of his means. When, in 2011, Simba Colt began selling BMW vehicles, he bought a BMW 5 Series that he never drove. Anne, on the other hand, drove to work in her Mercedes. She had worked for him from 1996. 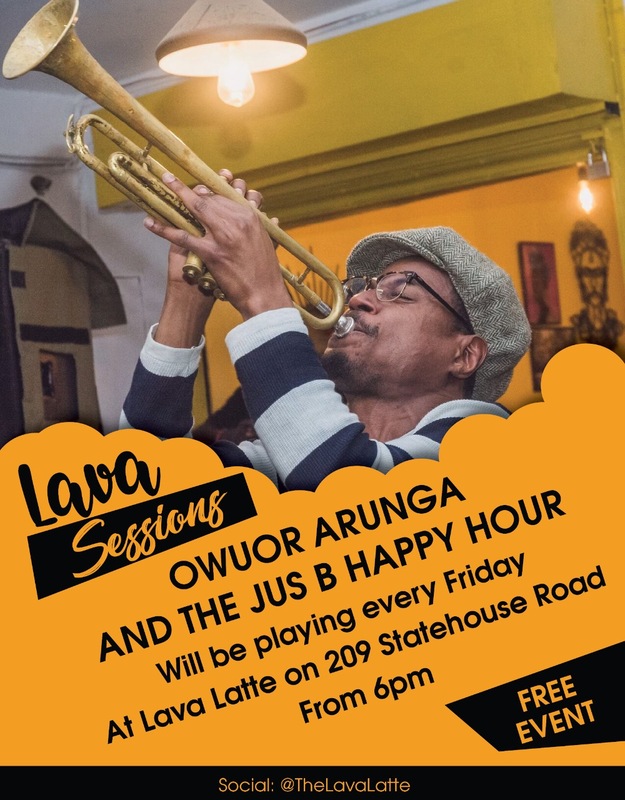 Whispers within CBK also indicate that another employee, the Chief Finance Officer, James Kaburu, had put away a tidy sum, which could run above a billion shillings, in a secondary bank account outside his employer. Abdulmalek’s second tool was a combination of intimidation and compartmentalization. Whenever he came out of his introverted shell, he was manipulative and vindictive. He reminded the people around him that he was big, and he knew the system and would have any of them arrested or harassed. He called in the police on anyone, even once on a housing committee for trying to force him to follow the association rules. Everyone and everything around him worked in silos such that he was the only one with a complete picture. The security agents he used to intimidate his colleagues and enemies hardly knew what he was actually playing at. Nor did his employees or even most of his business partners. His employees cant remember ever sitting at strategy and review meetings as a team. Instead, he met each of them individually, and would not know where in the pecking order they really fell. Even when they were moving different parts of his 15-year-long scam, many of them never knew how or what was actually happening. Abdulmalek’s third tool was the most ingenious, loaded free reign. When his former executives broke down the scandal to the board, and in turn, to the world, a lot of things made sense. If you worked for him, you could do whatever you wanted. You could come to work at whatever time you wanted, and dress however you liked. If you ran a department, that was your little kingdom to rule. But there was a catch, that you only had this free reign if you did exactly when he wanted when he wanted it done. Everyone around him, including Naeem Shah, the Head of Credit, and James Kaburu, the Chief Financial Officer, understood this. 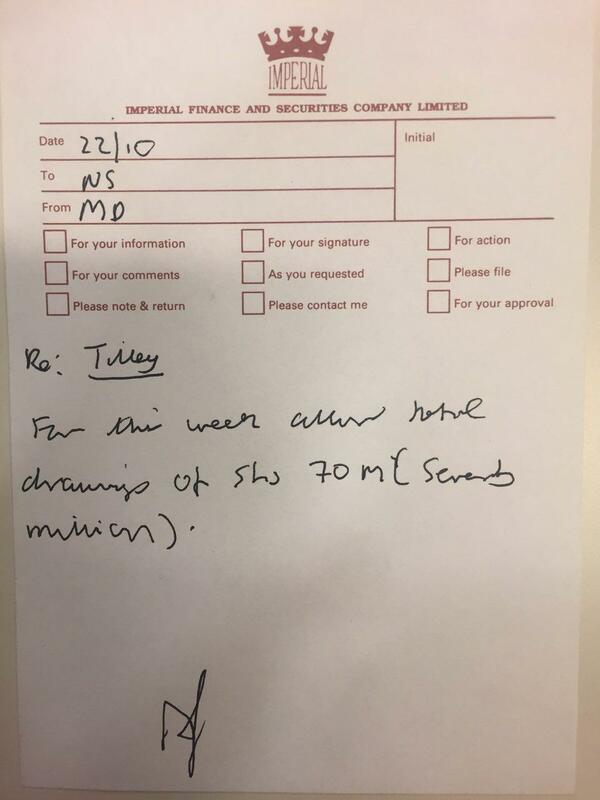 Every once in a while, handwritten chits would appear on their desks asking for money to be transferred to particular accounts. Entries would be hidden by manipulating the accounting software, allowing for Abdulmalek to produce three different books of accounts. He had the real one showing the missing money. The Board got one, and CBK, as the regulator, the third. As a lifelong bachelor with no hobbies, Abdulmalek was a creature of habit, thriving in a set schedule that allowed him to control everything around him. A contradiction of a man, he believed, especially in the last few years of his life, that the only rules that mattered were the ones he made. Every morning, at 4 am, he and his mom would be driven to the mosque at Parklands for prayers. By 7:30 am, he and his confidante, his Head of Treasury Nina Shah, would be seated at Capital Club, in the same building as the banks headquarters in Westlands, for breakfast. Then they would go downstairs to the office for the day. Every morning or lunch time, depending on his schedule, he drove to a city hotel to swim or to exercise in the gym. His friendship with the sari-wearing Nina Shah was a vital part of his day. Nina, as Head of Treasury, had insurmountable powers within the bank. In their email conversations where Abdulmalek and another good friend, Amin Manji, affectionately call her Ninabel, she appears as more a close friend than an employee. Born and brought up in Kisumu, she had worked for another controversial bank, Delphis Bank, owned by another Kisumu-born Asian, Ketan Somaia, before moving to Imperial Bank. The bank is most famous for having been Goldenberg’s banker for a time during the height of that scandal. Delphis was eventually sold and rebranded to Oriental Commercial Bank but Nina was thriving at Imperial Bank by then. She was not only powerful now but she was the MD’s confidante and, arguably, one of his few real friends. Outside of his childhood friend and business partner, Amin Manji and Nina, Abdulmalek didn’t have much of a social life. He never went out but for one social gathering a week. At such gatherings, he had a single beer and left, every time for many years, at exactly 10:30 PM. Every Sunday, he would be driven to Amin Manji’s house in Muthaiga for lunch. The schedule only changed for travel, again always meticulously planned, and emergencies. Even his accounts show an almost obsessive pattern. With his money, Abdulmalek’s skills as a banker were not blunted by his decade-long fraud. Instead, he was ever the more meticulous and cunning, although his sense of impunity got worse with time. He withdrew Shs. 5 million every month from his account, presumably to fulfill his financial obligations. When CBK changed its regulations to prohibit executive directors from owning shares in the banks they ran, he changed his shareholding and routed it through a trust, named after his father. For advisors to this trust, he tapped his younger brother, Salim Janmohammed, and his closest friends in the world, Nina Shah, and Amin Manji. Its beneficiaries, because he had no children, would be his brother’s sons. 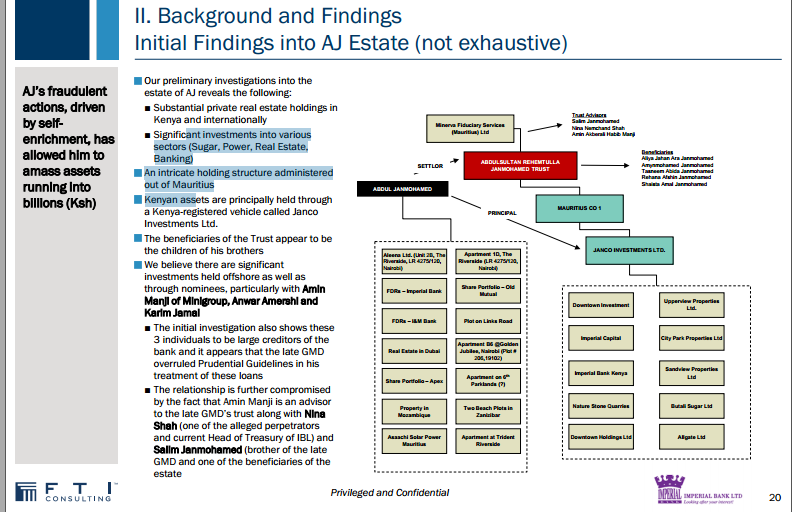 A screengrab of page 20 of the audit into Abdulmalek’s Estate. For a man who owned 12.5 percent of a bank, got paid millions of shillings a year, and stole tens of billions, Abdulmalek was surprisingly frugal. In his last few years alive, he added a few expensive suits to his wardrobe but nothing exceedingly flashy or extravagant. Even as he crossed from being a millionaire to a billionaire, he still used either of his Mitsubishi cars and not the BMW. The Lancer and the Gallant allowed him a sense of anonymity, and to him at least, gave him a sort of underdog status he could launch whenever he needed to achieve something. The only things he ever splashed on were Cartier watches, Montblanc pens, and three trips to Thailand every year. What Abdulmalek did during these holiday trips is sketchy, although they seem to tie in with a crucial layer of his drawn-out fraud. The clues from his emails and chits for transfers made to two companies owned by controversial businessmen suggest they had something on him. The most likely was that they had witnessed, and perhaps recorded, the mans dark side in Bangkok and Phuket. The person who was most shocked by Abdulmalek Janmohammed’s death was probably Abdulmalek himself. For 13 long years, he had become the invincible man, running a fraud so intricate only he and a few others knew of its real extent. His psychopathic sense of impunity had only grown in recent years and yet, billions of shillings later, he was still a free man. But that came to a head the day he keeled over and died. In mid-September last year, Abdulmalek came down with what he thought was a bad flu. It slowed him down but didn’t keep him from maintaining most of his schedule. On Tuesday the 15th, he left the bank and headed to Capital Club, upstairs, to interview someone from a rival bank. They sat at the bar. Barely 10 minutes into the conversation, Abdulmalek first felt nauseated and light headed. Before he could stop it, he vomited in his mouth, closing it in with his hand as he ran to the bathroom. He finished and walked back, apologizing to his company. When, a few minutes in, his heartbeat increased and then a debilitating pain shot through his chest, he must have known he was dying. The jolt of the pain threw him back on his seat, clutching his chest and turning his skin a visible pale blue. Whatever this was, he could not buy it off or threaten it away. The man he had been sitting with and the wait staff carried the now motionless man on his seat to the lift and down to the floor of the bank he ran and robbed. If anything was to be done, his loyal secretary of nearly two decades would decide. Nearly an hour after he suffered his first heart attack, Abdulmalek Janmohammed was driven into the Aga Khan University Hospital. Doctors stabilized his heart but his brain had already, at this point, been starved of oxygen for almost sixty minutes. That evening, he had two more heart attacks while in the Intensive Care Unit. With the third cardiac arrest that day, his heart stopped. Between the first and last heart attacks, someone filed an application to liquidate a company he owned with his brothers, Janco Investment (UK).